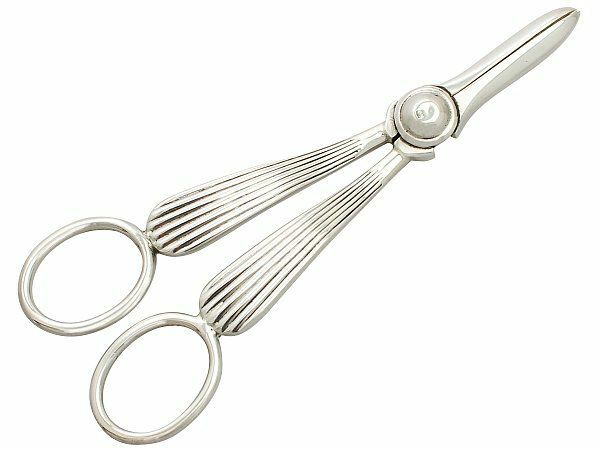 What Are Grape Shears / Grape Scissors? Grape shears and grape scissors are an instrument specifically designed for cutting grape stalks, and are smaller and designed especially for the purpose. 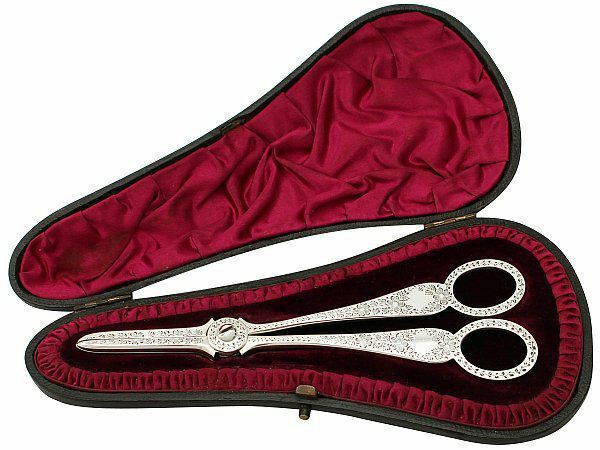 Grape shears were invented in the 19th century, and the earliest examples were from the Regency period, although very few have survived and these early examples are extraordinarily rare now. These shears or scissors are about 6 to 7 inches (15 to 18 cm) long. The handles are much longer than the blades, so that you can insert the blades deeply into a cluster of grapes. Most of the scissor ends have blunt tips, so that they won’t puncture the fruit. The grape shears would sometimes be found as part of a set with a grapestand, and the earlier grape shears from the late Georgian period were more like scissors, with equally long blades and handles. These were often gold-gilt, demonstrating the high value that the grape shears had been imbued with as an item of cutlery, and as part of a dinner service. 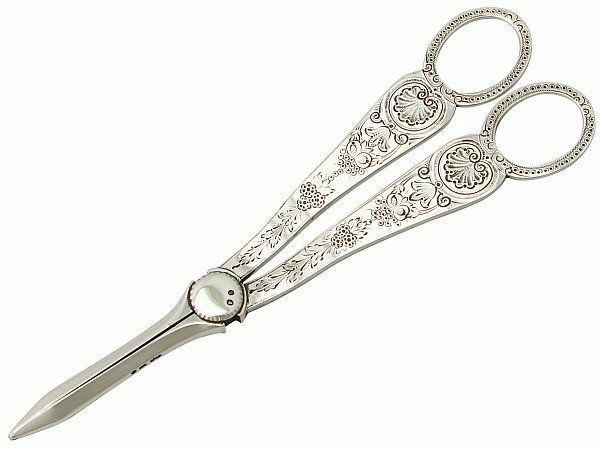 Later though, grape shears were usually made of sterling silver, as with most high quality dinnerware, so as to avoid tarnishing and to stand the test of time. After the 1850s, most of the shears produced included a flange which had been added to one of the blades, so that once the grapes had been cut, they could then be elegantly placed on to the diner’s plate while still holding the shears. The decoration on the shears varied widely, at first the shears often displayed a grape and vine motif, however many grape shears were part of a much larger dining set, so they would be embellished with the same pattern that was on the other cutlery. 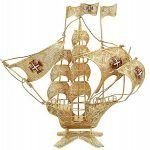 Because so many pieces of various shapes and sizes had to incorporate the same design, these were often more simple than the decoration on single items. Grape shears or grape scissors were commonly used during the dessert course of a formal dinner. Only after the grape stalks had been cut with the grape shears into single portions was it permissible to use your hands to eat the individual grapes. 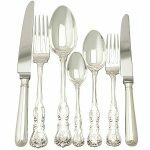 The dining etiquette of the period encouraged the development of specific utensils for eating and serving particular foods such as grapes. Dining etiquette was an important part of the Victorian code of polite society. 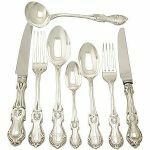 The Manners and Tone of Good Society, first published in 1879, instructed on how to navigate through the array of new cutlery and serveware that had come to fruition during the Victorian age. With the exception of some fruits and bread, touching food with your fingers was frowned upon. It was important to be able to recognise items such as asparagus tongs, marrow spoons and grape shears, and to know how to use them correctly. Grape shears are an antiquated idea for some; however they are as practical as always when in a formal dinner setting, and as grapes are still a common dessert accompaniment to cheese, they maintain their usefulness. Grape shears represent a bygone era, when a knowledge of- and abiding by the rules of etiquette and table manners dictated your standing in society. They are an artefact that symbolises polite society and are a charming piece of our civilization’s recent history which one is able to own. 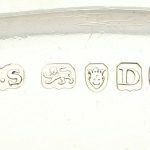 Jodie, I recently bought a pair of hallmarked silver plated grape shears made in October 1849 without previously knowing such things existed, so your article was very useful. The blade is flanged so that you can carry a bunch. We would like to use them but the cutting edge is blunt – is it safe to sharpen it or is it best to leave it as it is? Thanks. Thanks for sharing the information. It’s a useful information about Grape shears. Nice Blog. Scissors and shears generally perform the same tasks. They can easy be identified. Cover the operating end..and examine just the finger holder end. If openings are the same one has scissors. Others — shears. Previous Entry: Google Street View – We’re Here!